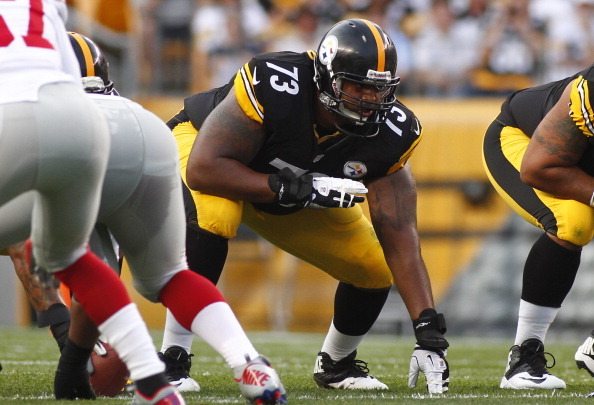 Steelers OL Ramon Foster knows the pain the fans felt Sunday when the team fell to the Titans 16-9 at Heinz Field in the opener. Foster spent camp trying to show one of his teammates at the time undrafted free agent rookie – Mike Golic Jr, the ropes in the Gillette Clear Gel’s “Built for Training”. You can see the page for the series HERE. Steelers Gab spoke to Foster about the season and more importantly, about the opener and what the team is looking to do to get better for Sunday. Ramon Foster: It’s unfortunate that Mike didn’t make it to the roster, but it was awesome that Gillette was following it, and for them to have Mike shadow me during camp, asking questions. Steelers Gab: Are you surprised Golic didn’t make the team, and do you think he’ll still play someday in the league? RF: I think so, I thought he did well at the time he was here, I am shocked that he’s not on a practice squad somewhere. He worked during practice as if he was going into the game to start, he picked stuff up right away, I am glad the cameras caught him doing that. Steelers Gab: What’s been the message this week, can you guys just take last week and forget about it, throw it away if you will? RF: We can’t what took place last week lightly, I don’t want anyone to think we were even slightly satisfied as to what happened. It’s something that we are definitely better than, and some things took place that you liked but it it clearly was not the outcome we would have liked. RF: With Maurkice being in there, he knew all the snaps and the call, and now Kelvin has to be aware this week being on the road with the snap count. If it’s Fernando, he has to understand the offense, he’s seen some of the stuff we do with the Titans, you can tell he understands it, I am excited to have him. RF: It wasn’t good, we all know that, this week all we can do is go up. We know we have to get better with that, we will be better with that, we have to be on top of that. This offense goes as long as the offensive line goes, Ben (Roethlisberger) says that every week, and this week we need to go out and prove it. RF: The fact that James is over there, we approach it the same way. I don’t think he’ll be over the top, James was the same way in practice when he was here, he went just as hard, I think he’ll be the same way this week. As far as the game goes, we hate what we put out there last week, this week we will execute better, and we will be more on top of our game than last week.